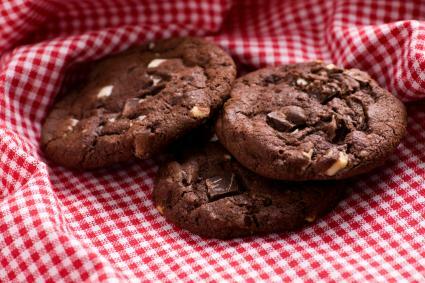 These fudgy chocolate cookies have a satisfyingly chewy texture that enhances the chocolate experience. It has no butter or baking powder at all and yet it is still a drop cookie that will rise when baked. What we use instead of the butter and levener is egg whites. The egg whites will form a kind of light meringue that the rest of the ingredients are added to. When baked, the cookie rises and forms a very nice cracked top and delicate crumb. The resulting chewy chocolate cookie goes great with a big ol' glass of milk or, as I prefer, a nice cup of tea. Using your stand mixer, beat the egg whites until foamy; a medium peak is good here. Mix the sugar, cocoa powder, flour, and coffee into the egg whites. Add the water and beat on low speed to mix. Then mix on medium speed for 3-4 minutes until the mixture thickens. Fold in the pecans and chips. Using a tablespoon, spoon the mixture onto the cookie sheets about 1 inch apart. Let cool on the cookie sheet for a few minutes before transferring to a rack to continue cooling. These are very soft cookies. Let them cool quite a bit before trying to transfer them to the rack.